Chief Minister Dr. Raman Singh today met World Brahman Federation of Chhattisgarh and Sarv Yuva Brahman Federation delegation led by National President Mr. Ajay Tripathi at his official residence. The delegation requested the Chief Minister Dr. Raman Singh to allot land and funds for the construction of hostel for poor boys of the general category in the capital. The members requested the Chief Minister to give encouragement to the study of Sanskrit language and rename the Government Engineering College as Martyr Lieutenant Arvind Shankar Dixit. The delegation submitted a memorandum in this regard. 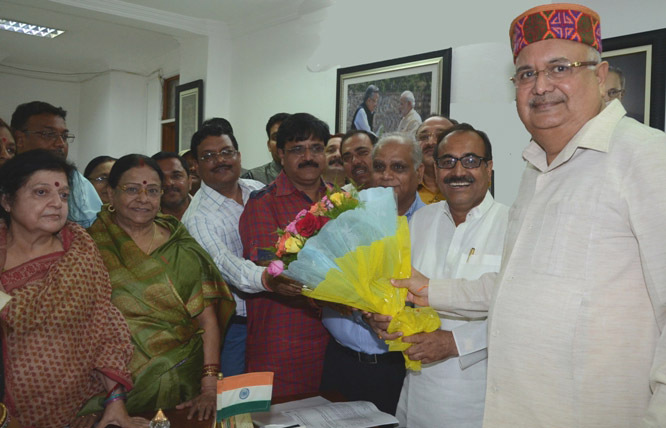 Dr. Raman Singh assured the delegation that he would look into the matter sympathetically. The delegation included Raipur Municipal Corporation Mayor Mr. Pramod Dubey, World Brahman Federation Chhattisgarh and Sarv Yuva Brahman Council State President Mr. Arvind Ojha, Vice-president Mr. Gunanidhi Mishra, secretary Mr. Hemant Tiwari, Mahila wing president Mrs. Neeraja Sharma and Youth wing president Mr. Abhinav Dubey .